We are finishing up our Halloween activities this week. 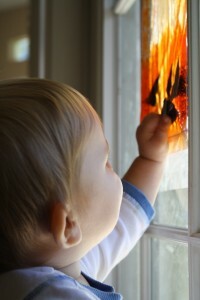 Sensory activities are big hit with all of the kids here, so I include them regularly. Our sensory bins vary. Sometimes they are large sensory bins for everyone to play in together like the fall sensory bin mentioned in last week’s wrap-up. Other times I use old envelope boxes and make individual sensory bins. 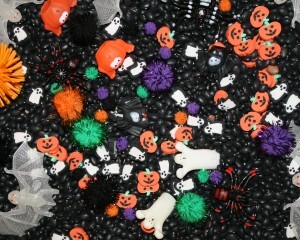 Our Halloween sensory bins are individual bins. The base is made of black beans. There are also Halloween theme items (erasers, pom poms, bats, spiders, and sticky webs) that I picked up from the dollar bins at Target. The six finger puppets were a last minute addition that the girls got from a trick-or-treat booth at our local zoo’s Halloween celebration this weekend. Score! This was by far his favorite activity of the day. He went back again and again and again! Tinker also spent a lot of time playing with the sensory bin. 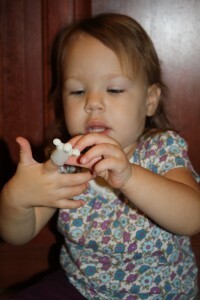 She loved the finger puppets! Orange! 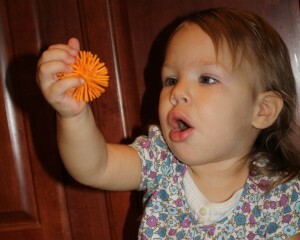 That was our focus color last week, so I was very excited when she picked this up and told us that it was orange! 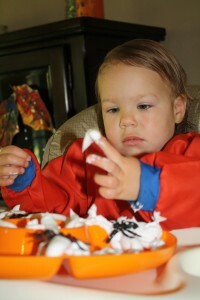 For more Halloween sensory bin ideas see these posts from Counting Coconuts and Love and Lollipops. I love the simplicity of a sensory bag. Grab some clear hair gel, food coloring (or something like it), clear packing tape and a plastic bag and you are ready. 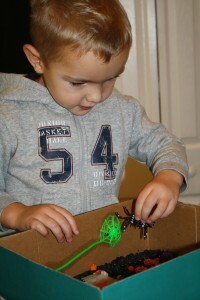 They take about two minutes to put together, and kids just love to play with them. Teach Preschool has an excellent sensory bags post that explains how to put them together and a tip for removing the white writing from the plastic bags. This post was the one I used to put mine together today. To go along with our Halloween theme, I added a few drops of red and yellow liquid food coloring and pieces of cut up felt to make a jack-o-lantern. 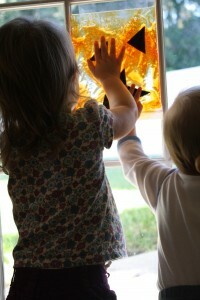 I used clear packing tape to seal the edges and then taped the sensory bag to the window. Everyone visited the sensory bag many times throughout the day, and even though there was only one they never had any trouble working together with it. I loved to see that! 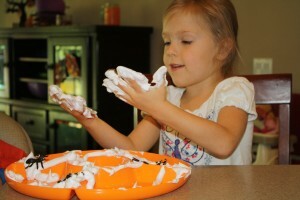 My girls love to play with shaving cream. It is definitely always on our must buy list when we visit the Dollar Tree (along with the hair gel we used for the sensory bags). Growing a Jeweled Rose shares an excellent list of must buy items at the Dollar Tree. This morning when I saw this cute shaving cream spider web activity from The Iowa Farmer’s Wife I knew we had to try it out today. It went along perfectly with the spider hats we made, but more about those in another post. Instead of making the web myself I let Lovey practice her fine motor skills by creating her own shaving cream web. It is tough work to push that big button with those tiny fingers, but she was determined. We were working on this while everyone else was still napping, but Tinker woke up just as Lovey finished her masterpiece. I was so touched when she let her baby sister have the first turn to play! What a great big sister! 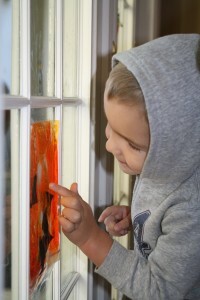 What are some of your favorite Halloween sensory activities? 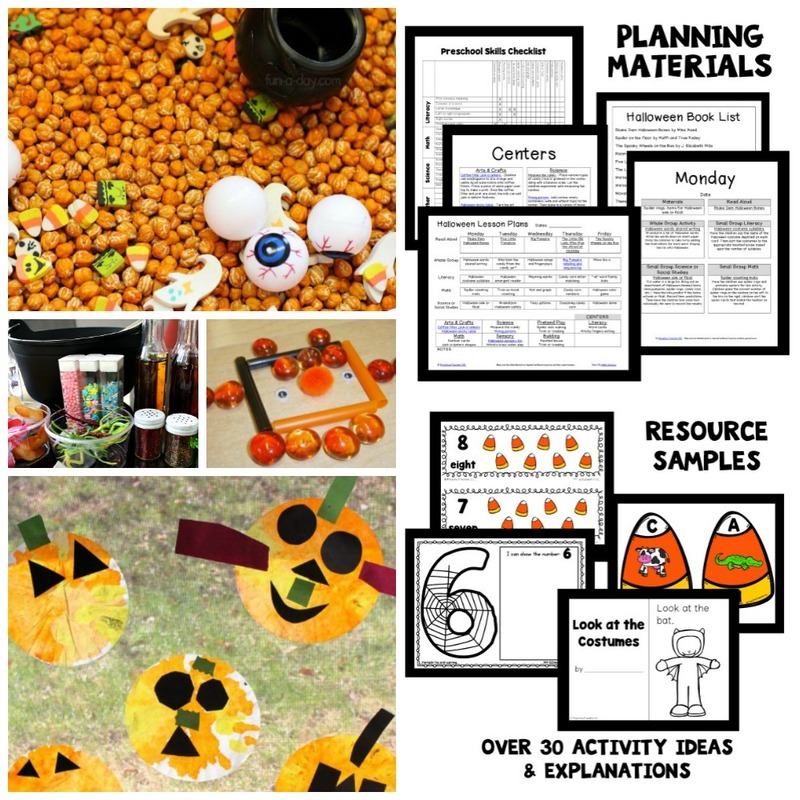 i love the jackolantern no mess sensory bag!!! i never thought of using it that way with images on it! thanks so much for linking this up to tip-toe thru tuesday! I am glad you liked it! 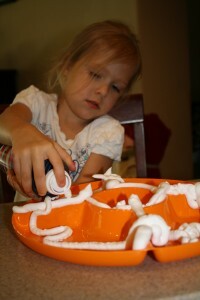 The kids really continued to enjoy it throughout the week…and so easy to make! 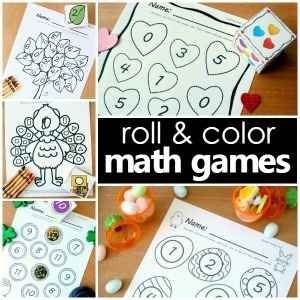 What fun activities!! 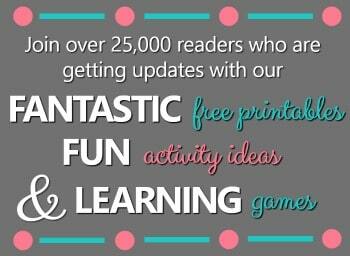 Thanks so much for the link back and so glad you liked the idea! I love your sensory pumpkin bag! Thanks so much for stopping in! Let me know if you try out the sensory bag. I need to do more sensory bins. Yours look great! And the kids do love them. Thanks for including a link to our googly eye bags. They were a hit. Thanks so much! I am not sure why it surprises me, but I am always still so amazed by all of the great learning and pretend play that comes along with exploring a sensory bin. Glad you liked the idea!